The hurricane is here. It has knocked down the bean tipi, smitten the amaranthus which are flaying their beards all over the place. 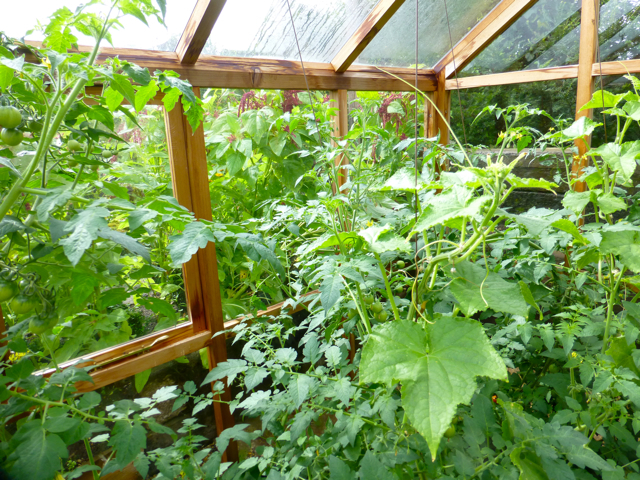 Time to retreat to the greenhouse. No solace in there. 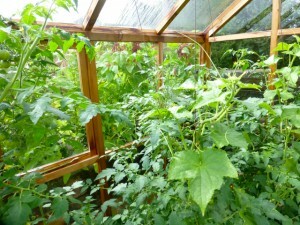 The tomato plants have gone crazy and limbered all over the cucumbers. I could hardly get through the door. The cucumbers in turn have aborted their fruits. I looked out of the windows to see the neighbour’s fruit cage has an artillery of blackberries about to spit all over our garden. And last of all, the bindweed has come into luminous flower. My beans too have been knocked sideways by Bertha, I have just done a quick post about them, though I feel we have got off lightly compared to other people on the news. I can sympathise about the brambles and bindweed, even though we think we have got them out, they still come back to haunt us! Oh I am sorry to hear of the destruction and craziness in the garden from the hurricane. Dear Donna – not a patch on what you guys get – seems feeble to complain at all!